Traditionally, code reviews are done only once before the code is merged into the main branch. This process does not continuously give feedback on code quality (especially of legacy code), does not support questions of new developers concerning existing code, and forces the developers to leave their IDE for commenting on code. 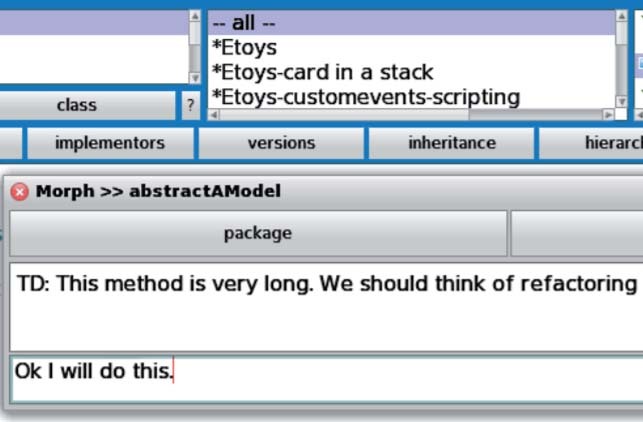 Code reviews play an important and successful role in modern software development. But usually they happen only once before new code is merged into the main branch. We present a concept which helps developers to continuously give feedback on their source code directly in the integrated development environment (IDE) by using the metaphor of social networks. This reduces context switches for developers, improves the software development process and allows to give feedback to developers of external libraries and frameworks.